We’ve had our Pontiac Vibe for a little over a month now and overall it’s a pretty decent car. It’s quite fun to drive, especially the nifty kick down button that turns off the over drive on the automatic. That little button makes it a lot easier to pass since you don’t have to do the typically gas pedal mash to try and force the transmission to kick down. When the engine is running in the higher RPM range (over about 4500), it has a decent amount of pull. Other great features are the huge glove box (big enough for a box a Kleenex and a stack of maps in addition to the owner’s manual! ), the huge center console storage box and the various other storage compartments scattered around the car. For a car this size, they really made the most of every available space by turning it all into storage. Not only that, the upright driving position makes it really easy to get in and out of the car and there is lots of head room, even for guys taller than (6’1″) me. Now there is one thing that I would definitely add, a telescoping steering wheel. If you have long legs like me, you’ll end up putting the seat back. The problem with that is you then end up quite far away from the steering wheel. Even with the seat in an upright position, I still have my arms almost completely straight if I want to be able to driving in the standard 10 and 2 position. I can’t drive that way for a long period as it is simply too uncomfortable. A telescoping steering wheel would at least allow me to pull the wheel an inch closer making for a much more comfortable position. Other interior oddities are the front cup holders (for some reason they are different sizes), the door “arm rest” and console are quite low (meaning they are useless as, well, arm rests) and the radio volume and tuning knobs can be easily confused in the dark when driving. The rear storage area (trunk?) is a decent size and the rear seats can be folded to provide a huge space. The only gripe I have about the space is the hard plastic floor surface. I’m sure there is a good reason to have it now and then but I’ve yet to find a good reason. We ended up having to buy the rear floor mat because everything you put back there would be constantly sliding around. I guess we could have opted for the cargo net but even having a jug of washer fluid back there was enough to drive us bonkers after only a couple minutes driving. The last comment I have is on the gauges. They are very bright and super easy to read. The gauges themselves are sunk in quite a bit which makes it difficult for your passenger to sneak a peek at your current speed. ;) There is one indicator light on the Pontiac Vibe that I really don’t understand. It is the “tail lights on” indicator. For some reason the car designers decided it was necessary to inform the driver when their tail lights were on. Basically, this indicator is on all the time when your head lights are on. Personally, I would hope that my tail lights were on and I don’t think it’s necessary to have an indicator light telling me this fact. One last thing some people might be interested in is the gas mileage. We drive the car on the highway a lot, probably 80% of our driving. After almost 5000km in cold January and February we are averaging about 9.0L/100km. I’m not overly impressed by that number at the moment but if that is the worst we get, I’m going to be quite happy. I’m going to be tracking my gas consumption for a while so hopefully it will get better when the temperatures get back above freezing. Stay tuned for more. 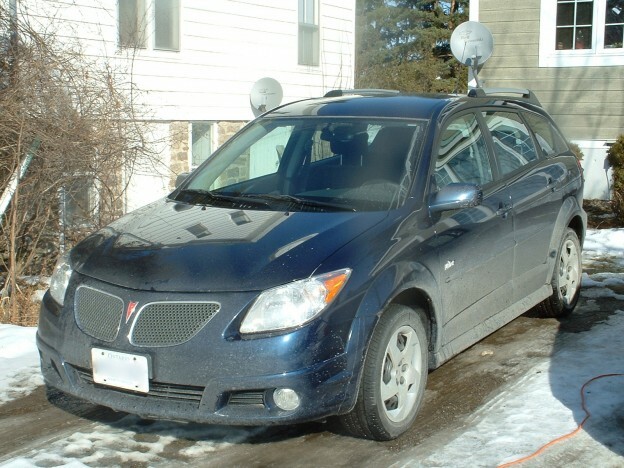 This entry was posted in Automotive, Review and tagged gas mileage, Pontiac Vibe, Review on 2006/02/21 by Jeff Ivany. Trip to Arizona from east Texas 36,7 MPG at posted speeds across Texas, 80mph in west Texas so mileage at 50 should even be better. Same car as the Toyota Matrix but a much better deal. Same old Toyota BS. These cars are assembled on the same line. Better mileage on premium fuel and runs better!